All around the country, state lawmakers are trying to force insurers not to cover abortions — not just when it comes to the upcoming state exchanges or for public employees, but even in private insurance plans. 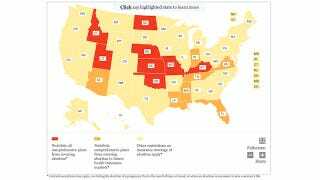 The ACLU, which is suing to overturn a Kansas law banning private insurance coverage of abortion, provides this handy map to help you keep track of the damage so far. (Theirs is interactive). Conservatives: All about free markets, except when it comes to your reproductive rights.